Constant Beatles/Merseybeat music played with a clientele that were around when it first came out. Small but not quite perfectly formed - floor slopes. Brew I had was good. Only downside is how small it is; otherwise was here when back in the Pool last weekend and stick by my 2015 review; if it's not the best pub in Liverpool Wezzielad it's certainly not far off. Rowdy older friendly clientele sums it up nicely! 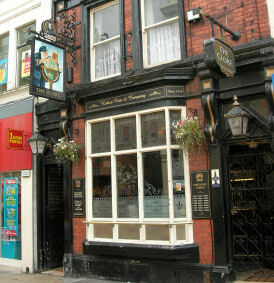 This may be (still a fair few to try for me) the best pub I've been to in Liverpool. The atmosphere is good, the ale is nice (4 when I was in including Landlord and Doom Bar) and the lady behind the bar was quite friendly and even let me and my pal try a sample of the Blueberry ale from Bradfield brewery. It can get quite tight for space but it wasn't enough to put me off enjoying my time here. Not the cheapest but I wouldn't say it's over the top with their prices either. Certainly a must visit I believe. Sill a haunt for the rowdy senior delinquent crowd, especially on a Saturday afternoon/evening when it can be quite noisy. They're still a friendly enough bunch though. Always liked this place for the staff, clientele and quality of the beer. Perfect location as well if waiting for a train or shopping.